The only museum learning focused school in the country, Langley has 1120 students with 320 being described as ‘pupil premium’, coming from disadvantaged backgrounds, and 116 students with special educational needs. As someone who is fairly clueless about education, the curriculum and acronyms for describing pupils, I learnt a lot immediately when the head teacher, Alison Lusuardi, welcomed us and gave us an overview of the school. The main school sponsor, the Arbib family, was central in ensuring that museum learning was at the heart of the school. Throughout the day, we were given some excellent examples of how museum learning was integrated with lessons. Our host, Mathew Britten, Museum Learning Officer, gave us an introduction to Slough with the poem of the same name by Betjeman. The impression given that Slough is often perceived negatively. Langley tries to change this. We were given a tour of the school by some of the students and the group enjoyed asking questions about pupil’s experience of the school and the influence museum learning has had on them. The building is impressive with a real sense of openness. There are no long corridors, the class rooms surround large, open spaces and all have windows. The idea behind this was so visitors and other pupils could see students or their peers learning. We asked whether the students found it distracting and they responded by saying they’ve just become used to it. On the ground floor space a class was learning the dance to Michael Jackson’s ‘Thirller’ whilst another group seemed to be partaking in some drama exercises and another group were on rowing machines. This vast space also included the museum collection with cases showing archaeological displays and soil sampling devices. 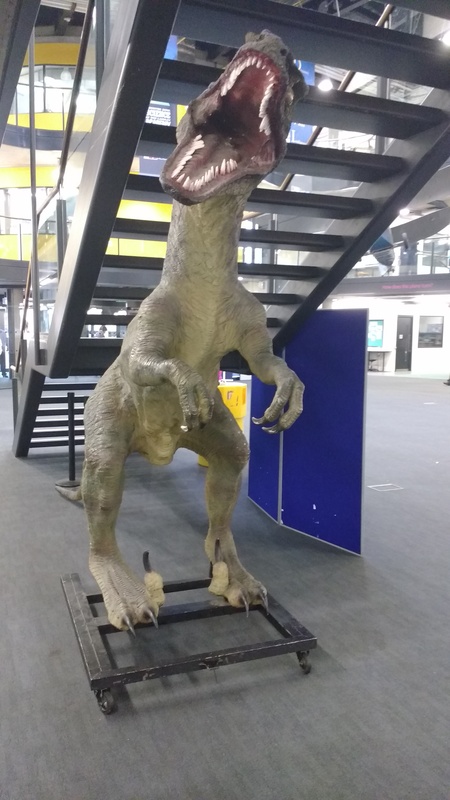 Cinema royalty was also represented with one of the ‘Velociraptor’ puppets from Jurassic Park. I must admit, I was a little star struck. We visited Langley’s primary school for a fantastic lunch and some networking (over a sausage roll). Museum Learning, we heard later from the Deputy Head of the Primary school Grace Shaw, was also included at this level. Hosting their own 100 objects exhibition, the new primary school has an area dedicated near the entrance to these displays. We heard some excellent case studies of students not engaging with literacy being inspired by archaeology. These students’ work suddenly improved due to reaching them through a subject that excited them. 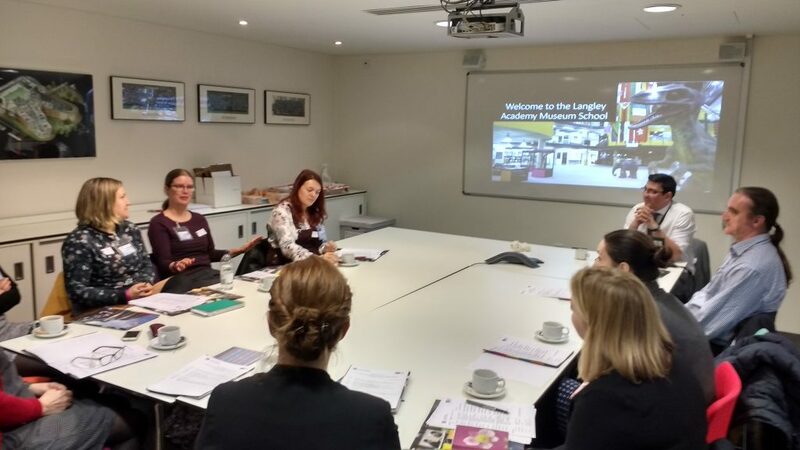 Talks from the head of museum learning, Jenny Bleay, and Hiral Cholai, Business studies teacher, gave the group fantastic pieces of advice on how to make education offers attractive to schools. Museums should look to make activities cross curricular, to appeal to a variety of subjects to make them most appealing to teachers. An example of how the Museum Learning team had worked with the business studies department was an intriguing case study of looking at how market stalls would have been set up in Windsor Castle. Students were asked to think about the placement of their stall, how traffic from potential customers would impact on their chances of success. As the day ended I know that all who attended had much to chew over and think about. But I also hope that they could take a lot of inspiration away with them through the advice given and hearing about the enthusiasm from the pupils regarding their museum visits and class room learning. I primarily left wondering what effect going to a school like Langley would have had on me?